I had a different post in mind for today, but I already wrote it last year. So since I have not posted any recipes for quite some time, I will do so today in honour of the lady in the link above – Mammy. His recipe for Cranberry Walnut Apple Cake was shared with us by Cecilia of THEKITCHENSGARDEN back at the end of last year. She described it as being very moist and soft in texture. I liked the sound of it and was anxious to try it. I made it, loved it and will do so again and again. I was a little worried about the moisture level: sugar, oil, eggs and cranberries, especially if the fruit had been frozen. So using my carrot cake recipe for reference (it is made with oil), I began with one cup of muscavado sugar the only brown in my pantry that day. A whiz round and it still looked oily, so I added another tablespoonful of caster sugar. Happy with that I added the eggs and vanilla. The dry ingredients were as listed, and added to the food processor. The mixture seemed heavy like soft toffee, but I continued and put the mixture in a large bowl before adding and mixing by hand, the remaining ingredients. 1. Whole fresh cranberries – well, as fresh as they can be after swimming across the pond, we do not grow them in these parts. 2. A diced Bramley apple – about 350g before the skin and core were removed. 3. Walnut pieces without further chopping. I like to see what I am eating in a cake. My next change was to use my holy tin savarin cake tin for more surface area and to prevent a soggy middle. The extra, I put in a one pound loaf tin. And baked them at 175°C/340°F. 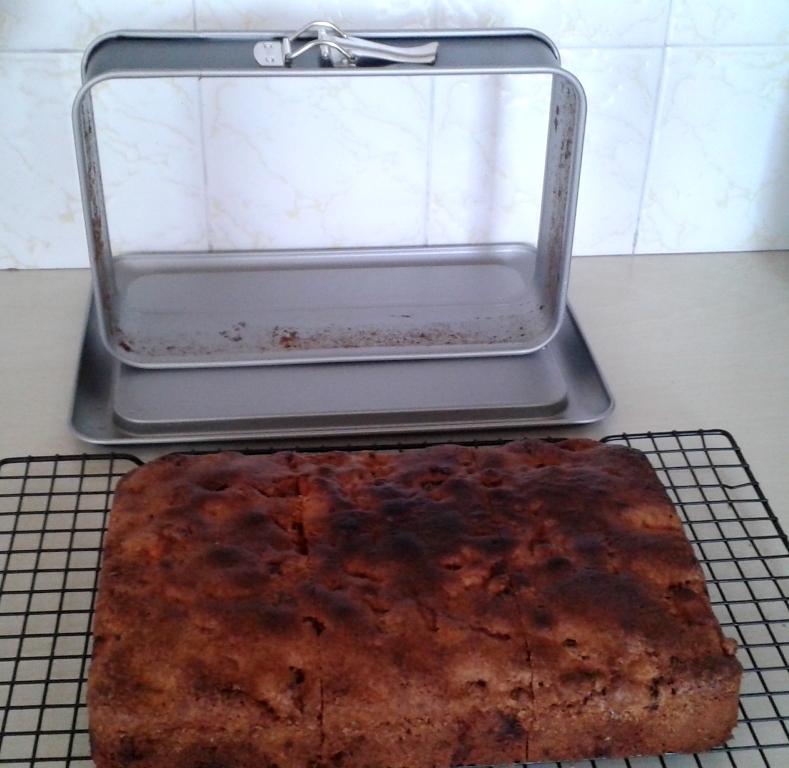 The small cake was ready after an hour and I covered the ring tin with greaseproof paper for another 30 minutes. Once cooled, I cut the small cake. It was delicious and not too sweet, nicely moist, but inclined to crumble when sliced. I liked the fact that it was possible to taste each individual fruit and nut piece. 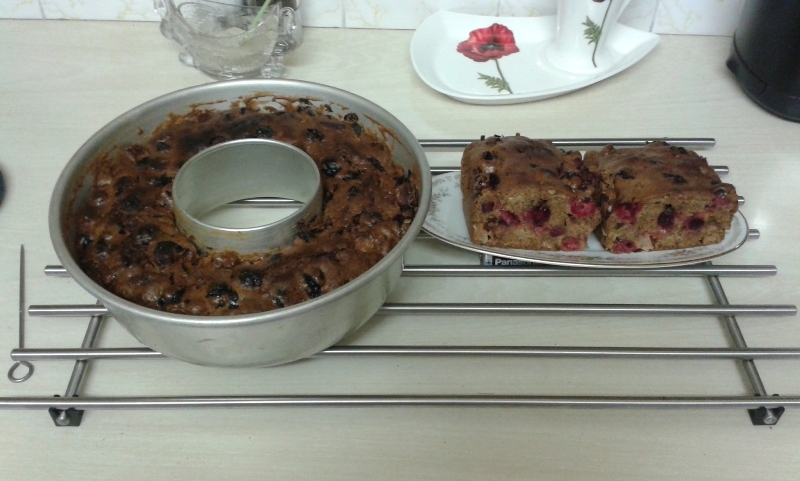 I did make it again, this time doubling the quantities and filled two 2lb and two 1lb loaf tins. I used a small on in the days leading up to the holidays, gifted the other one to a friend, I wanted a two pounder for my sister and wrapped and froze the last one. 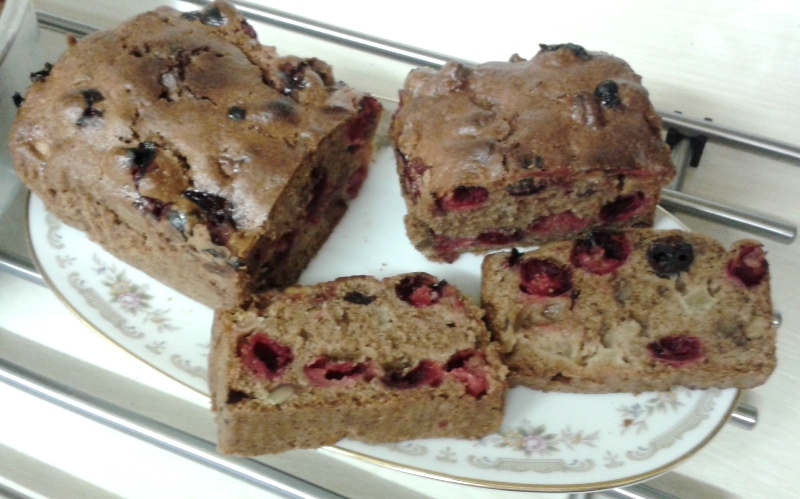 When I thawed that last loaf cake, it cut like a dream in perfect slices without crumbling and tasted perfect! Toss, coating fruit in flour mixture. Add to oil mixture, stir – then into baking tin and bake at 350 for 50 -60 minutes. Or until the cake is coming away from the sides of the tin and firm to the touch. On Saturday last, I was in the mood to bake so I set this recipe on the counter. Since fresh cranberries were not available, I decided to try a little variation of apples apricots, and pecans adding ground almonds and almond extract in place of the vanilla. Add to oil mixture, stir – then into baking tin and bake for 50 -60 minutes. Or until the cake is coming away from the sides of the tin and firm to the touch. This time I used a rectangular spring loaded tin and it worked perfectly and sliced like a dream. Today I will enjoy a slice or two as I sing a quiet Happy 101st Birthday to Mammy! UPDATE: Viv asked about converting weights and measures. This graphic below may help her and anyone else who might be confused. A page from an old magazine that I found years ago. You can zoom in on any section. I think it covers most of the FAQs to do with baking. This entry was posted in Cakes, recipes and tagged Apricot Pecan & Apple Cake, Cakes, Cranberry Walnut Apple Cake, Food Monday, Recipes, THEKITCHENSGARDEN on April 6, 2015 by Grannymar. 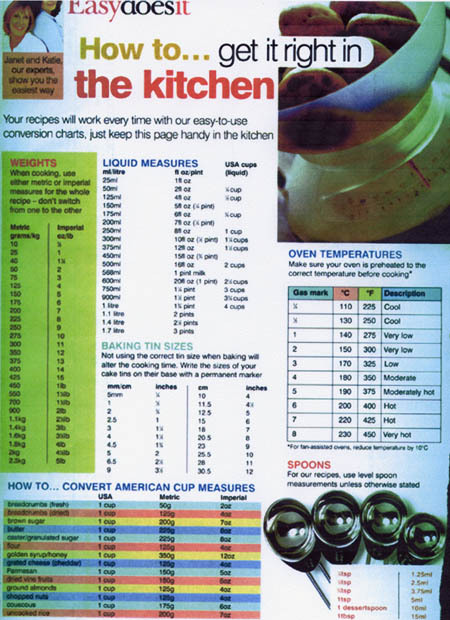 From Mrs Beeton’s Cookery and Household Management 1981 edition…. We are told on the flyleaf that it is ‘A totally revised, metricated and updated to bring it into line with the very latest developments in the cookery and Household management world’. How things have changed in the kitchen during the last thirty three years, never mind the one hundred and fifty three years since Isabella put her quill to parchment! This means the cessation of the monthly periods, which normally happens any time between forty and fifty-five. Many women are frightened of the ‘change of life’, but there is no necessary reason why trouble should arise. If you are worried, go and talk to your doctor. You can be sure that the disturbances, which include hot flushes, insomnia, joint pains, increase in weight, and the general irritability, will pass: but in a number of cases the emotional upset is made worse by domestic strain or by loneliness. By the time of the menopause, children are likely to be leaving home and husbands are often absorbed to an increasing degree by the responsibilities of their occupation. In such circumstances it is sensible to try to find a new interest in life, or to resurrect an old one. Although hot flushes are unpleasant they go unnoticed by other people, and there is no reason to worry about how you look in company. As for sexual activity, the menopause need make no difference, except, obviously, that there is no longer the possibility of pregnancy. There you go… ONE paragraph and it is all done and dusted! I actually wonder, how much of the above appeared when the good lady first published her Book of Household Management in 1861? I know it proved incorrect in relation to the ‘change of life’ in my case, but then I always claimed that I did not have a text book body. I think we should leave dear Isabella to her rest these days and discover more practical and up to date information and advice from a new book about to be published in September. If the group name for zebras is a dazzle, let me see what I can do to dazzle you with the group names of the animals who are regularly roaming the 5***** farmy hotel at THEKITCHENSGARDEN. The grist of our swarm, flock to peep over the five bar gate each day, braceing ourselves for the news of brooding hens, silent sheep, droving pigs (believe me, they go for a walk twice a day! ), pouncing dogs, strutting peacocks and pea hens or visiting children clutching eggs laid by plump hens. Drooling for a knob of fresh butter, cheese or yoghurt while waiting for the bread to rise to accompany the glories of the vegetable patch for supper each day all washed down by the home-made wine. We clutter and clowder for big servings of chowder, trying not to be a nuisance as we watch with Ton-ton and Boo, the dogs, as Daisy or Queenie provide milk for the tea, the churn and the animals. Good Queen Celi rules over her clutch of chickens, kine of cows, kennel of dogs, muster of peacocks and peahens, flock of sheep, and pigs led by Shiela, always watchful for the odd snake in the grass. When most of us are ready to collapse at the thought of all that work, Celi finds time to bottle and freeze food for the winter, make candles and soap, before sitting to document her day with photographs from the previous twenty four hours, on her blog for the fellowship of the farmy. A few months ago she threw us a line. An idea. A suggestion for a book. Letters for my Little Sister began as a real letter, that Cecilia Gunther was writing to her little sister. Their mother died when they were young, so they grew up with no one to lead them through the hurdles of life or to give them any very personal advice. Celi was trying to help her sister navigate the journey of aging and menopause. She felt there were others out there in the farmy fellowship who daily offered support or advice, and since they came from all ages & corners of the globe, they would have a wide perspective from dealing with mothers, aunts, sisters and daughters, never mind their own experiences of the dreaded word ‘menopause’. So a book was born sixty eight brave men and true women stepped up to the plate to share their experiences. The book includes essays, letters and poems all written to share this common experience that effects no two women the same way. Coming soon, from Sable Books, and Pre-orders are available. This entry was posted in Blogging, Books, Friends, Projects, Writing and tagged Cecilia Gunther, Letters for my Little Sister - A Fellowship Book, Menopause, Mrs Beeton’s Cookery and Household Management, Sable Books, THEKITCHENSGARDEN on August 22, 2014 by Grannymar.